Inform your parents and your school guidance counselor that you plan to go to a selective four-year college or university. If you are not taking Algebra and foreign language classes this year, make sure that your 9th grade class schedules include Algebra and foreign language classes. If you will attend a year-round school in the 9th grade, make certain that you will be assigned to a "track" that offers college preparatory courses. Strive to maintain an "A" or "B" grade point average. Find out if there are any academic enrichment programs offered at your school or at local colleges and universities, such as MESA, MedCor, Upward Bound, YBS, Talent Search, Cal Soap, etc. Request information about these programs from your guidance counselor. 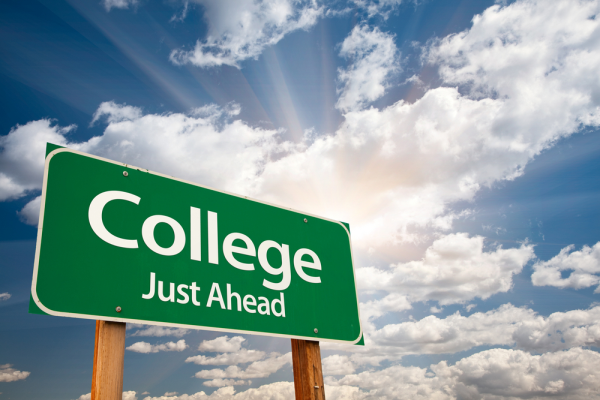 Remind your parents and your school guidance counselor that you plan to go to a selective four-year college or university. If you will attend a year-round school, make certain that you will be assigned to a "track" that offers college preparatory courses. In grades 9 through 12, plan to take at least 4 academic classes each year. In 9th grade, make sure that you take an Algebra I or Geometry class, as well as a foreign language class, during both semesters. Enroll in academic enrichment programs. Maintain an "A" or "B" grade point average. Form a study group with a few friends who also plan to go to college. Study together as often as possible. Visit a local community college, a California State University, a University of California campus, and an independent (private) college or university with your family or friends. Prior to your visit, call the Office of Admission for information about free campus tours and printed materials. you'll find these in bookstores and public libraries. You should also consider attending workshops on how to prepare for entrance exams--these may be offered by your high school, private firms, or colleges and universities. Visit colleges and universities to get a sense of the campus environment. Call ahead to arrange a campus tour and admissions presentation. Participate in academic enrichment programs. Review your 9th and 10th grade class schedule with your school guidance counselor to make sure that you have taken, and are taking, all college preparatory courses required for admission to selective universities. Take the PSAT (Preliminary Scholastic Aptitude Test) this year, rather than waiting until 11th grade. This will give you insight to the exam. Speak with your school guidance counselor about test dates, descriptive questionnaires, registration fees, and registration fee waivers. Colleges and universities organize excellent summer programs on campus for high school students. Ask your guidance counselor about these programs. Update your personal file with materials and information at the end of each semester. Continue to visit local colleges and universities with your family and friends. Some colleges will require SAT II (subject) exams. You may want to take 1 or 2 exams in academic areas you studied this year in May or June. Prepare for the PSAT by reading books and manuals with testing tips and sample questions: you'll find these in bookstores and public libraries. You should also consider attending workshops on how to prepare for entrance exams--these may be offered by your high school, private firms, or colleges and universities. Continue to visit college and universities to get a sense of the campus environment. Call ahead to arrange a campus tour and admissions presentation. Begin gathering information on scholarships. Check your local libraries for scholarship books. Also browse the Internet. Review your recent and current class schedule with your school guidance counselor to make sure that you have taken, and are taking, all college preparatory courses required for admission to selective university. Register and take the PSAT. Obtain forms from your school guidance counselor. Your school guidance counselor can also provide information about registration fee waivers. Maintain an "A" or "B" grade point average. Your junior year grades will weigh heavily in the college's admission decision. Attend college fairs and presentations by representatives of colleges and universities. Listen for school announcements to learn which college representatives will be visiting your school. Sign up to receive materials. Read all college materials you receive carefully. Compare requirements for admission and financial aid available at each institution. Create a file on colleges and universities that appeal to you. Write or call the Office of Admissions of these institutions in order to request a copy of the application for undergraduate admission and financial aid; a catalogue or viewbook; information about financial aid and materials about your proposed college major. Your school guidance counselor can provide the addresses and telephone numbers of these schools or look them up in your local library. If you have taken AP courses, register to take the AP exams. They are usually offered in May. These exams will provide college credit at most universities. Participate in academic enrichment programs. Colleges and universities organize excellent summer programs on campus for high school seniors. Ask your guidance counselor about these programs. Start thinking about when, and how many times, you will take the college entrance examinations (SAT I or ACT). Your school guidance counselor can provide you with test dates and descriptive brochures. You should take the SAT I and/or ACT in May or June, which will allow you to receive the results, meet with your guidance or college counselor, and take the SAT I and/or ACT again in the fall. Take SAT II (subject) exams in academic areas you studied this year. You should register one or two months in advance of the date of the examination. Request fee waivers from your counselor, if necessary. Write or call the colleges and universities you plan to apply for admission to request an application and financial aid information. Continue to visit college and universities to get a sense of the campus environment. Call ahead to arrange a campus tour and admissions presentation. This most likely will be your last chance to see an institution before applying. Begin requesting information on scholarships. Check your local libraries for scholarship books. Also check the Internet. Prepare for SAT I or ACT by reading books and manuals with testing tips and sample questions: you'll find these in bookstores and public libraries. You should also consider attending workshops on how to prepare for entrance exams--these may be offered by your high school, private firms, or colleges and universities. Review your recent and current class schedule with your school guidance counselor or college/career counselor to make sure that you have taken, and are taking, all college preparatory courses required for admission to the colleges and universities of your choice. Visit college and universities to get a sense of the campus environment. Call ahead to arrange a campus tour and admissions presentation. Attend college fairs and presentations by representatives of colleges and universities. Listen for school announcements for information about college representatives visiting your school. Sign up to receive materials. Check bi-weekly with your college advisor or director of your school's career center for information about scholarships awarded by local companies and community groups. Finalize the list of schools to which you will definitely apply for admission and make sure that you are aware of their requirements and deadlines for admission, financial aid and scholarships. Request fee waivers for admission applications. Early in September, register for SAT I and SAT II or ACT exams, depending on which are required by the institutions to which you plan to apply for admission. Many private colleges require the CSS (College Scholarship Service) Profile form, in addition to the Free Application for Federal Student Aid (FAFSA). Request and complete the CSS Profile form in late September or October. You can get these forms from your high school counselor. Prepare for exams by reading books and manuals with testing tips and sample questions. You might also consider attending workshops on how to prepare for these exams. Request any applications you did not receive over the summer and create a file for each school. Each file should include a checklist of deadlines and requirements for applications, transcripts, fees, test scores, recommendations, essays, financial aid applications, scholarship applications, etc. Write down deadlines onto your personal calendar and to make sure that you don't miss any deadlines. Practice filling out a copy of your application before filling out the original. Be sure to keep a copy of the completed original of each application in your file. Request fee waiver information from you high school, if application fees will be a burden for your family. Apply early! There are many different deadlines for colleges and universities. December is usually the latest you can apply for scholarships. Remind your parents to prepare their income tax statements as early as possible, since a copy will need to be sent to colleges to which you are applying for financial aid. In January or early February, mail your Free Application for Federal Student Aid (FAFSA), in order to be considered for financial aid (including Cal Grants, Pell Grant and other state or federal programs). You can obtain these forms from your high school counselor. In late March or April you will start receiving acceptance letters, financial aid offers and scholarship letters. Compare your options and discuss them with your family and counselor before deciding on which college to attend. Mail in your acceptance form and deposit check as soon as possible. May 1 is the deadline to turn in enrollment deposits. Contact colleges to which you were admitted but will not be attending to make them aware of your decision. Prepare to attend orientation at the college or university that you have chosen for the continuation of your educational career. UCLA - GSE&IS: College Choice Website Yes! You can go to college! All you have to do is take the right classes, study hard and meet all your application deadlines. UCLA has developed a fine list of suggestions to help you decide what sort of college you might want to attend. Preparing Your Child for College: A Resource Book for Parents The U.S. Department of Education has prepared this on-line book for parents and students. The entire text is available on-line. There is general information about college as well as hints on how to prepare for and choose the right college. Parents will find ideas on how to decide what college they can afford to send their child to and get some good ideas on long range planning for college. Parents: Your child should go to college!Easy to understand answers to your most basic question about college. How much does it cost? Can my child get in? Why should he/she go to college? OTTA - How much does college cost? Though no one wants to think of how money matters when choosing a college ... it IS an important factor to consider for parents and students. Check this page out for up-to-date facts on paying for college. How can I prepare for college while I'm still in high school? UCI Admissions and Relations with Schools: Ten Tips for Preparing for College On UC Irvine's page, you can find a list of things you can do to be a good candidate for your college of choice. BuffNET and Borders You can find information on SAT preparation, financial aid and get help searching for schools. The Student Center: Preparing for College This site offers links to hundreds of different college home pages. There are also links to SAT and ACT testing sites.You can get help in choosing the right college and understanding how to get student loans. Preparing for College Admissions Tests Plain and simple hints on how to score high on the SAT or the ACT. MidNet's Preparing for College South Carolina's MidNet offers many links to sites that provide information on how to prepare for college. Cap Rock (West Texas) -- Preparing for College Links You can find out how to register for the SAT and use a financial aid calculator to figure out costs. Parents can get ideas on how to fund a college education. Great information for juniors and seniors on finding the right college. TRFN - K-12: Beyond High School Pittsburgh's community-based computer network site provides links to prepare for college, choose the right college, pass the SAT and other entrance exams and finance yourself once you get there! How to Prepare for College while in High School Students with disabilities will find a lot of helpful information about preparing for college and locating the special resources they might need. Who should I talk to about going to college? Preparing Your Child for College: Questions to Ask Guidance Counselors These questions might help both parents and students get the information they need from guidance counselors. Kearney High School's Decisions 1995-96: Preparing for College The Kearney Komets help their college bound seniors find out what they need to know in order to apply and GET IN to their college of choice. Take a look! WWW Career Planning Resources A great list of American University home pages and links to lists of Canadian universities and community colleges. Find direct links to Santa Monica City College, Los Angeles City College, the Fashion Institute and DeVry. College Board Online - Services for Students and Parents One of the best sites on the WWW for the college-bound and their parents! Find out where you can apply to college on-line. Get info on SAT and ACT test dates, deadlines and locations. Improve your SAT scores by checking out the SAT Question of the Day.